I don't like wearing white. I know every fashionista reading this right now will be exclaiming, "What? How? White looks the best!" I agree, I also feel that white looks the best but on other people... My mom and husband love white, so ever so often, I find myself dressed in white because the outfit was a gift and now I can't make them feel bad can I? I am all about colour, so I have added loads of bright pink into this look. The beauty of wearing white is that is makes for a great base and compliments every colour you can think of. Pair it with a colour that you usually enjoy wearing and just have fun with it. There is a notion that white makes you appear bigger. Therefore, it is best you opt for an outfit or style your outfit to take the viewers eyes from top to bottom. By adding these vertical lines, the outfit becomes more flattering. The blue print on the kurta works to create this illusion. I have deliberately pinned the duppatta falling straight to one side and kept some of my hair in front. This way I have cut my broad shoulders and appear slimmer. You may not love the colour, but you can style the look to reflect your personality. The hairstyle, bag, jewellery, make-up, nail paint and shoes can all change the overall feel of the outfit. 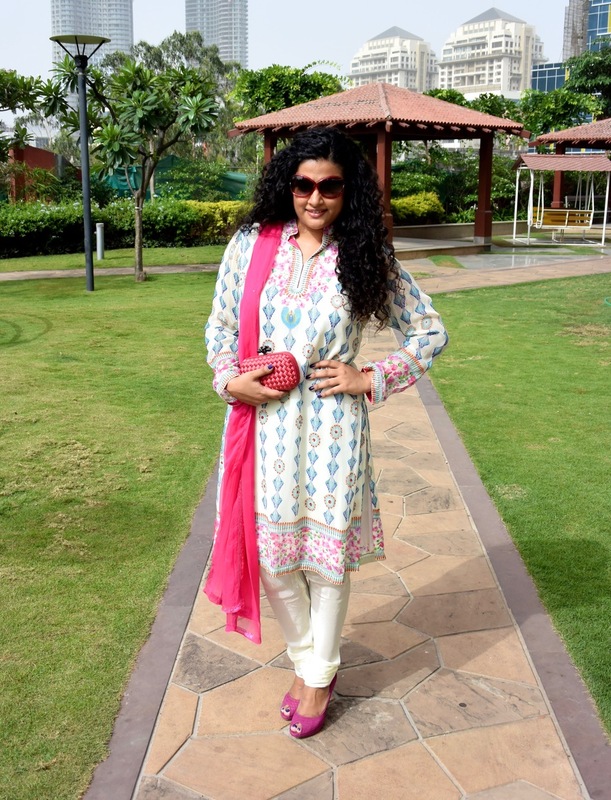 I have paired the churidar-kurta with accessories that are all very "me." I really like this outfit and I have worn this many times. The straight cut, tight pants and full-sleeves tick all the right boxes when it comes to dressing for my body type.